1. Floor and Ceiling Runners — Channel-shaped runners, 3-5/8 in. wide min., fabricated from No. 25 MSG galv steel. Attached to floor and ceiling with fasteners spaced 24 in. OC, max. 2. Building Units* — Insulated steel panels 24, 30 or 42 in. wide. Attached through retainer clips to studs or support steel with No. 14 hex head self-tapping screws located at each joint in the concealed lip of the units and spaced in accordance with the structural design requirements. CENTRIA, A DIVISION OF NCI GROUP, INC — Types Formawall Dimension Series, Formawall Dimension Series Graphix, Versapanel 1.75", 2.5", 4"; Versawall 2", 2.5", 4", and MetalWrap. 3. Steel Studs — Channel shaped, 3-5/8 in. wide min, 1-1/4 in. legs, 3/8 in. folded back returns, min 0.020 in. thick (25 gauge) galv steel spaced 24 in. OC max. Studs 3/8 in. less in lengths than assembly height. 4. 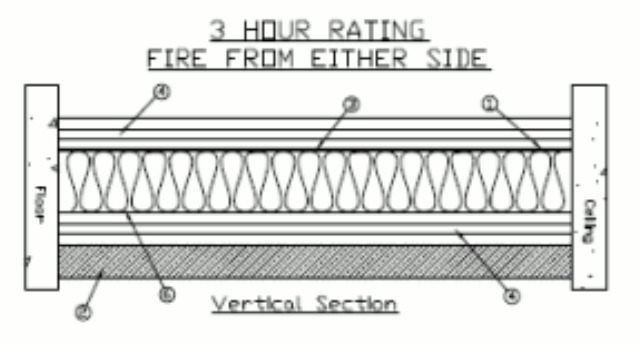 Gypsum Board* — (For 1 and 2 hour ratings when exposed on interior face only) — Any 5/8 in. thick UL Classified Gypsum Board that is eligible for use in Design Nos. L501, G512 or U305. For a 1 hour rating, nom. 5/8 in. thick, 4 ft wide, two layers applied vertically with joints centered over studs. Inner layer attached to studs and runners with 1 in. long, Type S screws located 5/8 to 3/4 in. from sides and ends of wallboard and spaced 12 in. OC. Face layer attached through inner layer into studs and runners with 1-5/8 in. long Type S screws located 5/8 to 3/4 in. from sides and ends of wallboard and spaced 18 in. OC. Joints to be staggered from the inner layer. For a 2 hour rating, nom. 5/8 in. thick, 4 ft wide, four layers applied vertically with joints centered over studs. Base layer attached to studs and runners with 1 in. long, Type S screws spaced 12 in. OC. Second layer attached through base layer into studs and runners with 1-5/8 in. long Type S screws spaced 18 in. OC. Third layer attached through base layer into studs and runners with 2-1/4 in. long Type S screws spaced 18 in. OC. Face layer attached through base layer into studs and runners with 3 in. long Type S screws spaced 18 in. OC. Joints to be staggered 24 in. from the inner layer joint. Screws offset a min. 6 in. from layer below. 4A. Gypsum Board* — (As an alternate to Item 4) — Nominal 5/8 in. thick, 4 ft wide panels, secured as described in Item 4. 4B. 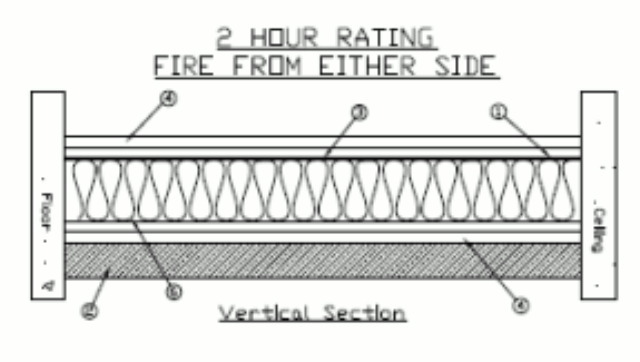 Gypsum Board* — (For 1, 2 and 3 hour ratings when exposed on either side of wall) - Any 5/8 in. thick UL Classified Gypsum Board that is eligible for use in Design Nos. L501, G512 or U305. See Item 4 for list of Companies. For a 1 hour rating, 5/8 in. thick, 4 ft wide, attached to steel studs and floor and ceiling track with 1 in. long, Type S steel screws spaced 8 in. OC. along edges of board and 12 in. OC in the field of the board. Joints oriented vertically and staggered on opposite sides of the assembly. For a 2 hour rating, 5/8 in. thick, 4 ft wide, two layers applied vertically on both sides of studs with joints centered over studs. Base layer attached to studs and runners with 1 in. long, Type S screws spaced 16 in. OC statting 8 in. from the edge of the board with an additional screw placed 1-1/4 in. from each edge of boad. Second layer attached through base layer into studs and runners with 1-5/8 in. long Type S screws spaced 16 in. OC starting 8 in. from each edge of the board with an additional screw placed 1-1/4 in. from each edge of the board. Joints to be staggered 24 in. from the inner layer joint. Screws offset a min. 6 in. from layer below. For a 3 hour rating, 5/8 in. thick, 4 ft wide, three layers applied vertically on both sides of studs with joints centered over. Base layer attached to studs and runners with 1 in. long, Type S screws spaced 24 in. OC. Second layer attached through base layer into studs and runners with 1-5/8 in. long Type S screws spaced 24 in. OC. Third layer attached through second and base layers into studs and runners with 2-1/4 in. long Type S screws spaced 12 in. OC. Joints to be staggered 24 in. from the inner layer joint. For all layers, an additional screw shall be placed 1-1/4 in. from the edge of the board. Screws offset a min. 6 in. from layer below. 4C. Wall and Partition Facings and Accessories* — (As an alternate to Item 4) — Nominal 5/8 in. thick, 4 ft wide panels, secured as described in Item 4. PABCO BUILDING PRODUCTS L L C, DBA PABCO GYPSUM — Type QuietRock QR-527. 5. Subgirts (optional) — Hat or Z shaped min 1/2 in. deep, min .045 in. thick (18 gauge) galv steel, attached to studs, 48 in. OC with No. 14 self-tapping screws or No. 14 self-drilling screws. 6. Batts and Blankets* — (Optional) — Placed in stud cavities. 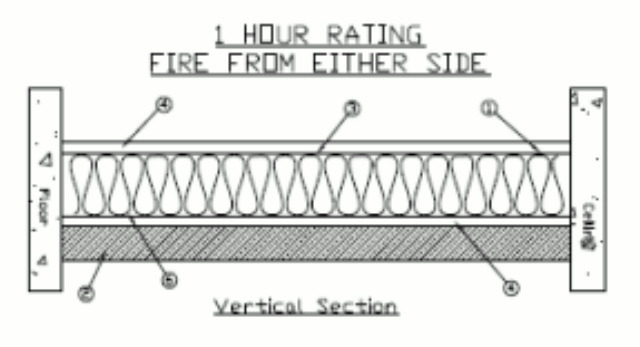 Any glass fiber or mineral wool batt material bearing the UL Classification Marking as for Fire Resistance, of a thickness to completely fill the stud cavity. See Batts and Blankets (BZJZ) Category for names of Classified companies.